natural gas prices, on the other hand, ended little changed for the second week in a row…after rising two-tenths of a cent to $2.664 per mmBTU to begin the so-called shoulder season last week, natural gas for May delivery fell four tenths of a cent over the five trading sessions of this week to end the week at $2.660 per mmBTU, as even a bullish miss of expectations on the EIA storage report was not enough to outweigh weak supply/demand balances…the natural gas storage report for the week ending April 5th from the EIA indicated that the quantity of natural gas held in storage in the US increased by 25 billion cubic feet to 1,155 billion cubic feet over the week, which still left our gas supplies 183 billion cubic feet, or 13.7% below the 1,338 billion cubic feet that were in storage on April 6th of last year, and 485 billion cubic feet, or 29.6% below the five-year average of 1,640 billion cubic feet of natural gas that have typically remained in storage as of the first weekend in April in recent years….this week’s 25 billion cubic feet injection into US natural gas storage was less than consensus expectations of a 29 billion cubic foot addition to storage, while it was quite a bit more than the 5 billion cubic feet of natural gas that are normally added to gas storage during the first week of April…. 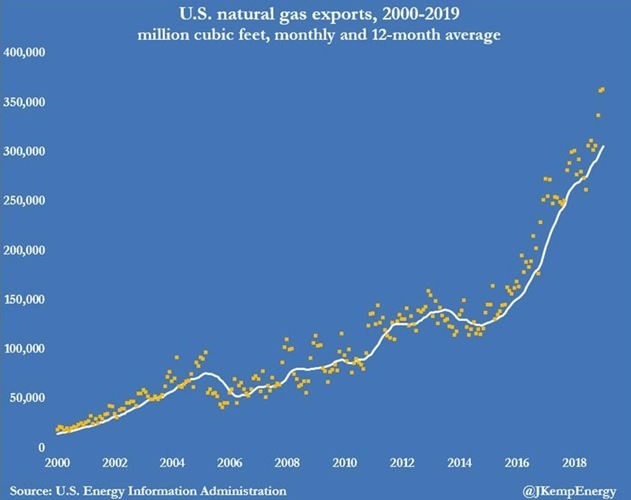 for the coming week, the EIA’s natural gas storage dashboard indicates that 131 billion cubic feet of natural gas were consumed in residential and commercial use; that compares to the 186 billion cubic feet used by residential and commercial accounts in the week we’ve just reported on…if other demand factors are little changed otherwise, we should see an injection of around 80 billion cubic feet of natural gas into storage with next week’s report..
meanwhile, US oil refineries were using 16,100,000 barrels of crude per day during the week ending April 5th, 251,000 more barrels per day than the amount of oil they used during the prior week, while over the same period the EIA reported that 1,004,000 barrels of oil per day were being added to the oil that’s in storage in the US…..therefore, this week’s crude oil figures from the EIA would seem to indicate that our total working supply of oil from net imports and from oilfield production was 654,000 fewer barrels per day than what was added to storage plus the oil refineries reported they used during the week…to account for that disparity between the supply of oil and the disposition of it, the EIA inserted a (+654,000) barrel per day figure onto line 13 of the weekly U.S. Petroleum Balance Sheet to make the reported data for the daily supply of oil and the consumption of it balance out, essentially a fudge factor that is labeled in their footnotes as “unaccounted for crude oil”….with that much oil unaccounted for, we have to figure that one or more of this week’s oil metrics is in error by a statistically significant amount.. (for more on how this weekly oil data is gathered, and the possible reasons for that “unaccounted for” oil, see this EIA explainer)…. 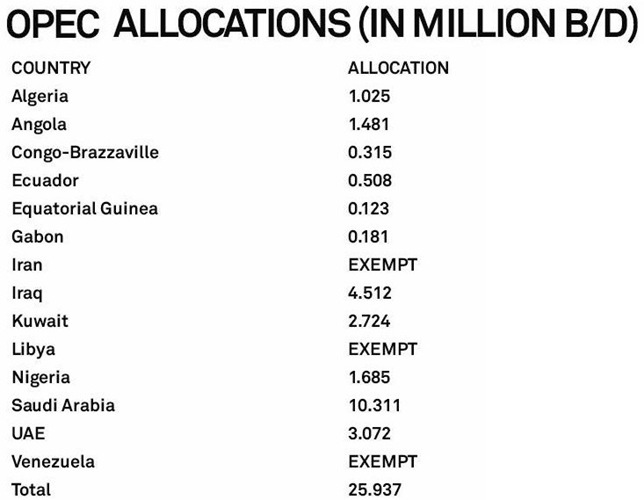 with the increase in the amount of oil being refined, the gasoline output from our refineries was likewise higher, rising by 356,000 barrels per day to 10,169,000 barrels per day during the week ending April 5th, after our refineries’ gasoline output had increased by 156,000 barrels per day the prior week….but even with those back to back increases in gasoline output, this week’s gasoline production was only a bit more than the 10,150,000 barrels of gasoline that were being produced daily during the same week last year….at the same time, our refineries’ production of distillate fuels (diesel fuel and heat oil) rose by 168,000 barrels per day to 5,038,000 barrels per day, after that output had decreased by 55,000 barrels per day the prior week…but even after this week’s increase, the week’s distillates production was still 4.1% less than the 5,256,000 barrels of distillates per day that were being produced during the week ending April 6th, 2018…. 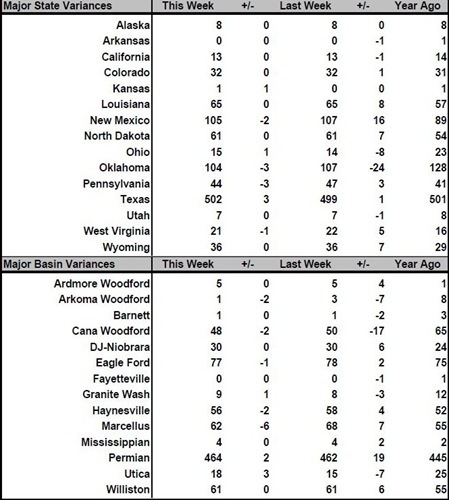 meanwhile, the two rig increase in the Permian basin masks quite a bit of movement​ inside the basin​, as 4 rigs were added in Texas Oil District 8, which corresponds to the core Permian Delaware, and 2 rigs were added in Texas Oil District 8, or the northern Permian Midland basin, while two Permian rigs were concurrently shut down in Texas Oil District 7C, or the southern Permian Midland basin…hence, since Texas added 4 Permian rigs, the two rigs shut down in New Mexico ​would have been in the Permian Delaware on their side of the state line.. Within core services, the price index for shelter rose 0.4% on a 0.4% increase in rents, a 0.3% increase in homeowner’s equivalent rent, and a 0.9% increase in lodging away from home at hotels and motels, while the shelter sub-index for water, sewers and trash collection rose 0.3%, and other household operation costs were on average 0.2% lower….at the same time, the price index for medical care services was 0.3% higher, as inpatient hospital services rose 0.5% and health insurance rose 1.3%…meanwhile, the transportation services index was unchanged as car and truck rentals fell 1.9% while vehicle maintenance and servicing rose 0.9% and intercity bus fares rose 9.0%…on the other hand, the recreation services price index was 0.4% higher as the index for rental of video discs and other media rose 2.4% and admissions to sporting events rose 5.2%….in addition, the index for education and communication services was 0.1% higher as college tuitions rose 0.8%….lastly, the index for other personal services was down 0.3% as the price index for tax return preparation and other accounting fees fell 7.8%…among core line items, prices for televisions, which are now 19.3% cheaper than a year ago, the price index for telephone hardware, calculators, and other consumer information items, which is down by 14.9% since last March, and the price index for dishes and flatware, which is down by 10.7% from a year ago, have all seen prices drop by more than 10% over the past year, while the price index for sewing machines, fabric and supplies, which has now increased 10.3% year over year, is the only line item to increase by a double digit magnitude over that span…. 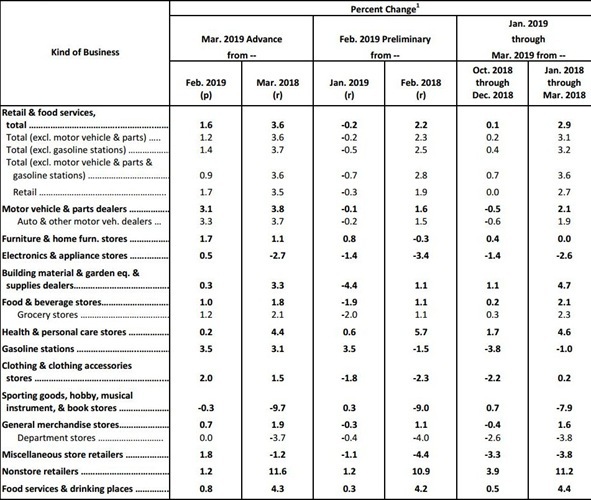 As we noted, the price index for final demand for goods, aka ‘finished goods’, was 1.0% higher in March, after being 0.4% higher in February, 0.8% lower in January, 0.5% lower in December, 0.5% lower in November, 0.8% higher in October, and 0.1% lower in September….the finished goods index rose because the price index for wholesale energy was 5.6% higher, after rising 1.8% in February falling 3.8% in January 4.3% in December and 5.2% in November, and as the price index for wholesale foods rose 0.3% after falling 0.3% in February, while the index for final demand for core wholesale goods (excluding food and energy) was 0.2% higher….wholesale energy prices rose on a 16.0% jump in the wholesale price for gasoline and a 12.6% increase in the wholesale price of diesel fuel, while the wholesale food price index rose on a 17.6% increase in wholesale prices for fresh and dry vegetables….among wholesale core goods, wholesale prices for cigarettes rose 3.4%, railroad equipment prices rose 2.4% and wholesale prices for tires rose 1.1%..
At the same time, the index for final demand for services rose 0.3%, after being unchanged in February, rising 0.3% in January, being unchanged in December, rising 0.1% in November, 0.8% in October, and 0.2% in September, as the February index for final demand for trade services rose 1.1% while the index for final demand for transportation and warehousing services fell 0.8%, and the core index for final demand for services less trade, transportation, and warehousing services was unchanged….among trade services, seasonally adjusted margins for apparel, jewelry, footwear and accessories retailers rose 4.2%, margins for major household appliances retailers rose 6.8%, and margins for computer hardware, software, and supplies retailers rose 3.0%, while margins for fuels and lubricants retailers fell 5.9%… among transportation and warehousing services, margins for airline passenger services fell 1.5% and margins for truck transportation of freight fell 0.8%…among the components of the core final demand for services index, margins for deposit services (partial) rose 6.3% and margins for arrangement of cruises and tours rose 5.9%.. 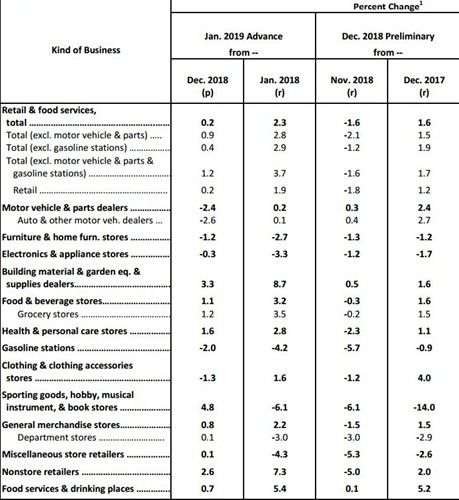 This report also showed the price index for intermediate processed goods rose 0.8% in March, after rising 0.4% in February, falling 1.4% in January, falling a revised 1.1% in December and a revised 0.6% in November, after rising 0.7% in October and 0.1% in September….the price index for intermediate energy goods rose 1.6%, as refinery prices for gasoline rose 16.0% and refinery prices for diesel fuel rose 12.6%, while producer prices for natural gas sold to electric utilities fell 4.7%…on the other hand, prices for intermediate processed foods and feeds fell 0.3%, as the price index for wholesale meats fell 2.0% and producer prices for prepared animal feeds fell 0.9%…meanwhile, the core price index for intermediate processed goods less food and energy was unchanged as a 2.5% decrease in the index for plastic resins and materials offset a 2.7% increase in the price index for building paper and board …prices for intermediate processed goods are still 0.8% higher than in March a year ago, now the 28th consecutive year over year increase, after 16 months of negative year over year comparisons, as intermediate goods prices fell every month from July 2015 through March 2016…. Summary: New orders for manufactured goods in February, down four of the last five months, decreased $2.6 billion or 0.5 percent to $497.5 billion, the U.S. Census Bureau reported today. This followed a virtually unchanged January decrease. Shipments, up following four consecutive monthly decreases, increased $2.0 billion or 0.4 percent to $505.5 billion. 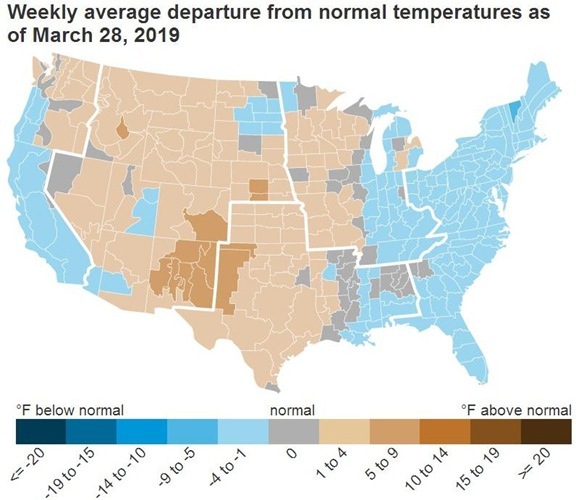 This followed a 0.3 percent January decrease. Unfilled orders, down four of the last five months, decreased $3.6 billion or 0.3 percent to $1,177.6 billion. This followed a 0.1 percent January increase. The unfilled orders‐to‐shipments ratio was 6.54, down from 6.57 in January. Inventories, up twenty‐seven of the last twenty‐eight months, increased $2.0 billion or 0.3 percent to $687.8 billion. This followed a 0.5 percent January increase. The inventories‐to‐shipments ratio was 1.36, unchanged from January. 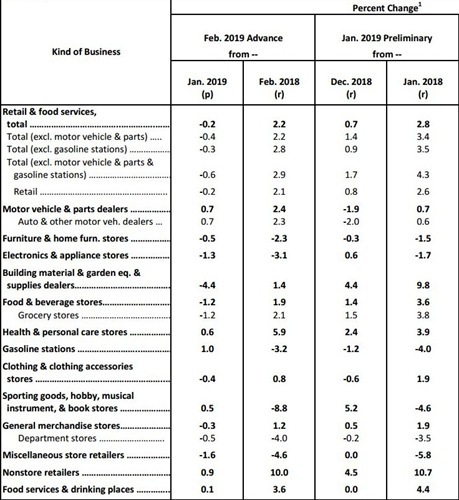 New Orders – New orders for manufactured durable goods in February, down following three consecutive monthly increases, decreased $4.2 billion or 1.6 percent to $250.5 billion, unchanged from the previously published decrease. This followed a 0.1 percent January increase. Transportation equipment, also down following three consecutive monthly increases, led the decrease, $4.1 billion or 4.5 percent to $86.2 billion. New orders for manufactured nondurable goods increased $1.5 billion or 0.6 percent to $247.0 billion. Shipments – Shipments of manufactured durable goods in February, up three of the last four months, increased $0.5 billion or 0.2 percent to $258.5 billion, unchanged from the previously published increase. This followed a 0.5 percent January decrease. Computers and electronic products, up four of the last five months, led the increase, $0.3 billion or 1.0 percent to $28.0 billion. Shipments of manufactured nondurable goods, up following three consecutive monthly decreases, increased $1.5 billion or 0.6 percent to $247.0 billion. This followed a 0.1 percent January decrease. Petroleum and coal products, also up following three consecutive monthly decreases, led the increase, $1.4 billion or 2.8 percent to $51.9 billion. Unfilled Orders – Unfilled orders for manufactured durable goods in February, down four of the last five months, decreased $3.6 billion or 0.3 percent to $1,177.6 billion, unchanged from the previously published decrease. This followed a 0.1 percent January increase. Transportation equipment, also down four of the last five months, led the decrease, $3.6 billion or 0.4 percent to $807.3 billion. Inventories – Inventories of manufactured durable goods in February, up twenty‐five of the last twenty‐six months, increased $1.3 billion or 0.3 percent to $418.9 billion, unchanged from the previously published increase. This followed a 0.5 percent January increase. Transportation equipment, up five of the last six months, drove the increase, $1.3 billion or 1.0 percent to $134.1 billion. Inventories of manufactured nondurable goods, up two consecutive months, increased $0.7 billion or 0.3 percent to $268.9 billion. This followed a 0.6 percent January increase. Petroleum and coal products, also up two consecutive months, drove the increase, $0.9 billion or 2.3 percent to $40.2 billion. 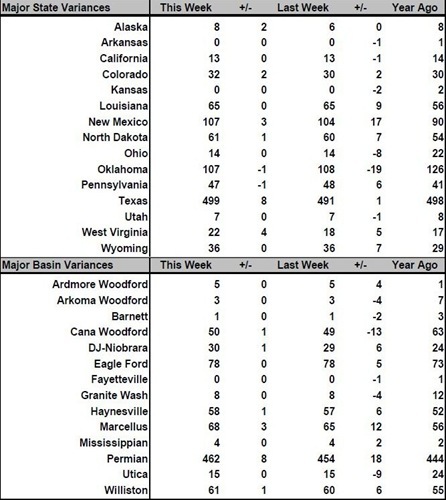 the natural gas storage report for the week ending March 29th from the EIA indicated that the quantity of natural gas held in storage in the US increased by 23 billion cubic feet to 1,130 billion cubic feet over the week, which still left our gas supplies 228 billion cubic feet, or 16.8% below the 1,358 billion cubic feet that were in storage on March 30th of last year, and 551 billion cubic feet, or 30.9% below the five-year average of 1,635 billion cubic feet of natural gas that have typically remained in storage at the end of March in recent years….this week’s 23 billion cubic feet injection into US natural gas storage was more than the 16 billion cubic feet addition that analysts surveyed by S&P Global Platts had expected, while it was a complete reversal of the average of 23 billion cubic feet of natural gas that are normally withdrawn from gas storage during the last week of March, an early injection which has not happened to that degree since March of 2012…. 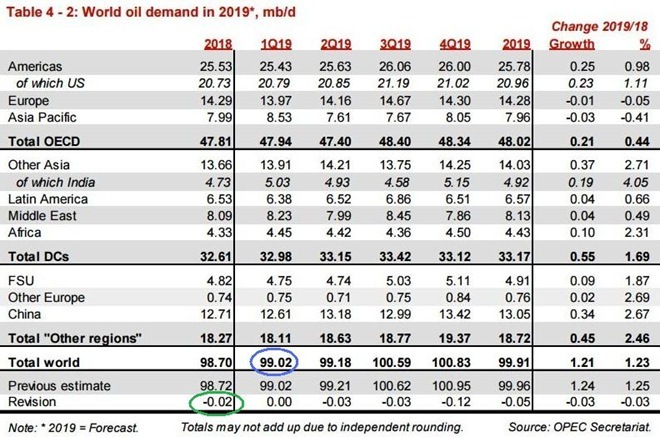 meanwhile, US oil refineries were using 15,849,000 barrels of crude per day during the week ending March 29th, 18,000 more barrels per day than the amount of oil they used during the prior week, while over the same period 1,034,000 barrels of oil per day were reportedly being added to the oil that’s in storage in the US…..therefore, this week’s crude oil figures from the EIA would seem to indicate that our total working supply of oil from net imports and from oilfield production was 643,000 fewer barrels per day than what was added to storage plus the oil refineries reported they used during the week…to account for that disparity between the supply of oil and the disposition of it, the EIA inserted a (+643,000) barrel per day figure onto line 13 of the weekly U.S. Petroleum Balance Sheet to make the reported data for the daily supply of oil and the consumption of it balance out, essentially a fudge factor that is labeled in their footnotes as “unaccounted for crude oil”….with that much oil unaccounted for, we have to figure that one or more of this week’s oil metrics is in error by a statistically significant amount.. (for more on how this weekly oil data is gathered, and the possible reasons for that “unaccounted for” oil, see this EIA explainer)…. 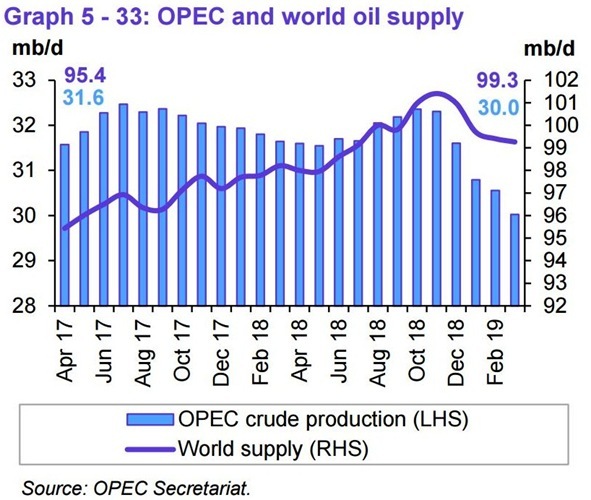 with little change in the amount of oil being refined, the gasoline output from our refineries was somewhat higher, rising by 156,000 barrels per day to 9,813,000 barrels per day during the week ending March 29th, after our refineries’ gasoline output had decreased by 268,000 barrels per day the prior week….but even with that increase in the week’s gasoline output, this week’s gasoline production was still 3.0% less than the 10,115,000 barrels of gasoline that were being produced daily during the same week last year….at the same time, our refineries’ production of distillate fuels (diesel fuel and heat oil) fell by 55,000 barrels per day to 4,870,000 barrels per day, after that output had increased by 2,000 barrels per day the prior week…​and after this week’s ​modest decrease, the week’s distillates production was 2.9% less than the 5,016,000 barrels of distillates per day that were being produced during the week ending March 30th, 2018…. Meanwhile, the March household survey indicated that the seasonally adjusted extrapolation of those who reported being employed fell by an estimated 201,000 to 162,960,000, while the similarly estimated number of those qualified as unemployed fell by 24,000 to 6,211,000; which thus meant a rounded decrease of 224,000 in the total labor force…since the working age population had grown by 145,000 over the same period, that meant the number of employment aged individuals who were not in the labor force rose by 369,000 to 95,577,000….with the number of those in the labor force decreasing while the civilian noninstitutional population was increasing, the labor force participation rate fell by 0.2% to 63.0%….at the same time, the decrease in number employed as a percentage of the increase in the population was enough to lower the employment to population ratio from 60.7% to 60.6%…however, the small decrease in the number unemployed was not enough to impact the unemployment rate, which remained at 3.8%….meanwhile, the number who reported they were involuntarily working part time rose by 189,000 to 4,499,000 in March, which apparently wasn’t enough to change the alternative measure of unemployment, U-6, which includes those “employed part time for economic reasons”, as it remained at 7.3% in March, which in February had been the lowest since January 2001….. Private Construction: Spending on private construction was at a seasonally adjusted annual rate of $994.5 billion, 0.2 percent (±0.8 percent)* above the revised January estimate of $993.0 billion. Residential construction was at a seasonally adjusted annual rate of $540.9 billion in February, 0.7 percent (±1.3 percent)* above the revised January estimate of $536.9 billion. Nonresidential construction was at a seasonally adjusted annual rate of $453.6 billion in February, 0.5 percent (±0.8 percent)* below the revised January estimate of $456.0 billion. Public Construction: In February, the estimated seasonally adjusted annual rate of public construction spending was $325.8 billion, 3.6 percent (±1.6 percent) above the revised January estimate of $314.4 billion. Educational construction was at a seasonally adjusted annual rate of $76.3 billion, 0.8 percent (±2.0 percent)* above the revised January estimate of $75.7 billion. Highway construction was at a seasonally adjusted annual rate of $111.1 billion, 9.5 percent (±5.3 percent) above the revised January estimate of $101.5 billion. That price index showed that aggregate construction costs were down 0.1% in February, after they had increased by 0.6% in January, and had increased by 0.1% in December and in November…on that basis, we can estimate that February construction costs were roughly 0.5% more than those of December, 0.6% more than those of November, and 0.7% more than those of October, and of course 0.1% less than January…we then use those relative percentages to inflate the lower cost spending figures for each of the 4th quarter months vis a vis February, which is arithmetically the same as adjusting higher priced January and February construction spending downward, for purposes of comparison….this report gives annualized construction spending in millions of dollars for the 4th quarter months as $1,275,953 in December, $1,273,143 in November, and $1,290,551 in October, while annualized construction spending was at $1,320,305 in February and $1,272,178 in January….thus to compare January’s nominal construction spending of $1,307,335 and February’s figure of $1,320,305 to inflation adjusted figures of the fourth quarter, our formula becomes: ((1,320,305 +1,307,335 * 0.999) / 2 ) / ((1,275,953 * 1.005 + 1,273,143 * 1.006 + 1,290,551 * 1.007)/ 3) = 1.01988, which tells us that real construction spending over January and February was up by 1.988% from that of the 4th quarter period, or up at a 8.19% annual rate…then, to figure the potential effect of that change on GDP, we take the difference between the 4th quarter inflation adjusted average and that of January’s & February’s adjusted spending as a fraction of 4th quarter GDP, and find that 1st quarter construction spending is rising at a rate that would add about 0.63 percentage points to 1st quarter GDP, an estimate which assumes there would be little change in real construction in March..
At the same time, the value of seasonally adjusted inventories of durable goods, also a major GDP contributor, rose by $1.3 billion or 0.3 percent to $418.9 billion, after end of January inventories were revised from $417.0 billion to $416.6 billion, now up 0.5% from December….increasing inventories of transportation equipment were responsible for the February increase, as they rose $1.3 billion or 1.0 percent to $134.1 billion….